FILE - American troops look out toward the border with Turkey from a small outpost near the town of Manbij, Syria, Feb. 7, 2018. The Islamic State terror group is promising to keep targeting U.S. and U.S.-backed forces in the northern Syrian town of Manbij, where a suicide attack this week killed four Americans and five coalition soldiers. The claim, published in IS's most recent online newsletter, Naba, comes as U.S. defense and intelligence officials are questioning whether the terror organization's security and intelligence networks run deeper and remain more intact than previously thought. "The Attacks of the Mujahedeen Will Continue in Manbij Until Sharia Governance Returns," the newsletter proclaimed, according to a translation by the SITE Intelligence Group. IS "began executing attacks against the apostates months ago," it added, citing an interview with an IS fighter who is part of one of several "security detachments operating in the area." Previous targets included coalition-backed military and intelligence officials, the newsletter claimed, along with several unsuccessful attempts to attack U.S. forces. "ISIS remains an adaptive and dangerous adversary," a senior U.S. counterterrorism official told VOA, using an acronym for the group. And while IS's claim of responsibility for Wednesday's attack in Manbij has yet to be confirmed, "we believe the claim is authentic," the official said, calling the attack "very typical" of IS insurgent activities. 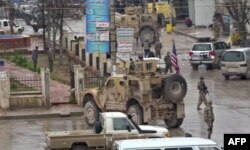 FILE - An image grab taken from a video obtained by AFP-TV on Jan. 16, 2019, shows U.S. troops gathered at the scene of a suicide attack in the northern Syrian town of Manbij. A key concern for some officials and analysts are the levels of detail and coordination demonstrated in the Manbij attack. "There were several photos, videos and detailed discussions identifying the coalition aircraft posted on social media immediately after the attack," said Jade Parker, a former counterterrorism analyst in support of U.S. military activities. "This may present an enduring challenge for the coalition in countering the insurgents because Islamic State intelligence capabilities, in particular, prolong the group's ability to target individuals perceived as threats to the survival of their terrorist organization," she added. The IS newsletter, Naba, itself detailed how the group's fighters or informants have been watching U.S. forces at their bases around Manbij, noting how and when they move, and how they interact with members of the coalition-backed Syrian Democratic Forces. And the IS suicide bomber struck just as the U.S. patrol approached a restaurant known to have been frequented by the American forces. FILE - A woman embraces a Syrian Democratic Forces (SDF) fighter after she was evacuated with others by the SDF from an Islamic State-controlled neighborhood of Manbij, in Aleppo governorate, Syria, Aug. 12, 2016. Just as troubling to former officials is that all this took place in an area that was liberated from IS more than two years ago. "Manbij should have been a showcase of how stability comes back and ISIS can be contained and defeated, and it's not," former U.S. Ambassador to Syria Robert Ford said during a conference call on U.S. Syria policy. "These ethnic tensions that I've talked about, the economic grievances ... will always give ISIS a recruiting base," he said. The most recent U.S. estimates have put the overall number of IS fighters in Syria at 13,000 to 14,500, many of them outside areas controlled by U.S.-backed forces. U.S. military officials have also said many IS fighters have been content to lie low, hiding in remote areas or as part of sleeper cells, waiting until the opportune moment to activate and strike. The attack Wednesday in Manbij appears to have been one of those moments. Defense officials Friday identified three of the Americans killed in the attack as Army Green Beret Chief Warrant Officer Jonathan Farmer, 37; Navy Chief Cryptologic Technician Shannon Kent, 35; and Defense Intelligence Agency operations support specialist Scott Wirtz, 42. A fourth American, civilian contractor Ghadir Taher, also was killed, her company, Valiant Integrated Services, confirmed. Taher's family told the Atlanta Journal-Constitution the 27-year-old had emigrated to the U.S. from Syria as a child and was working there as an interpreter. "As Wednesday's attack demonstrates, ISIS remains a threat," acting chief Pentagon spokesman Charles Summers Jr. said Friday. "We will continue to hit the remnants of ISIS hard to destroy any residual networks and ensure its enduring defeat." The Pentagon has already begun pulling some equipment from Syria as part of a withdrawal announced by U.S. President Donald Trump last month. But Summers insisted that despite the mandate to get the 2,000 U.S. troops in Syria back home, there was no timetable for their return. "The withdrawal is based on operational conditions on the ground, including conversations with our allies and partners," he said, adding that the number of troops in Syria "will fluctuate during this process." 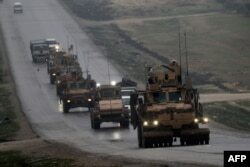 But critics of the Trump administration have complained that any withdrawal will be more complicated given the president's announcement that U.S. forces will be returning home. "His recent choices, unfortunately, are already giving the Islamic State — and other American adversaries — new life," Brett McGurk, former U.S. envoy to the Global Coalition to Defeat IS, wrote in an op-ed in The Washington Post Friday. "The Islamic State and other extremist groups will fill the void opened by our departure, regenerating their capacity to threaten our friends in Europe — as they did throughout 2016 — and ultimately our own homeland," he added.